OTTAWA, ON – Wednesday, February 15, 2017, 10 a.m. ET – BioCanRx, and its partners, today announced funding for 16 collaborative research projects in novel therapies to cure cancer including research aimed at developing clinical Chimeric Antigen Receptor modified T cell (CAR-T) manufacturing capabilities in Canada. 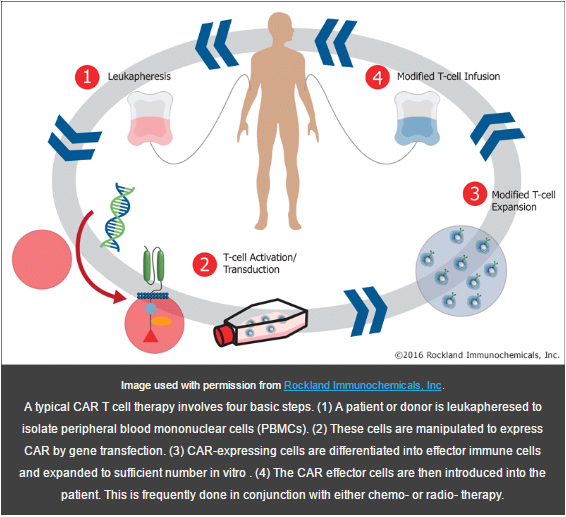 CAR-Ts are a powerful new tool for treating cancer and have begun to provide hope to patients without other therapeutic options to treat and cure their disease. CAR-T cell therapy is on the cutting edge of cancer therapeutics and has shown promise in paediatric and adult patients with certain blood cancers such as acute lymphoblastic leukemia and lymphoma. CAR-T is a promising technology, involving sophisticated manufacturing and expertise. Canada has the basic laboratory infrastructure in place and this new funding will help to fully develop the expertise and capacity required to deliver this technology. BioCanRx is investing in research projects advancing several innovative engineered T cell designs, which will further benefit from this infrastructure and capacity investment, and accelerate delivery of these novel concepts into clinical testing in Canada. This Canadian capacity development will pave the way to enable Canadian patients to access this new technology, and will give Canadian researchers the necessary resources to deliver on their innovations in CAR-T and other engineered T cell platforms. This CAR-T manufacturing initiative is unique in that the Canadian academic community recognized a gap and stepped up to drive Canadian solutions to meet grassroots efforts taking place in the U.S., China and Europe. To help ensure CAR-T cell therapy is brought to patients safely and effectively, BioCanRx is funding a companion Clinical, Social, and Economic Impact project. It will review the existing base of knowledge and involve patient consultation to design a rigorous CAR-T clinical trial protocol ready to implement once the products are ready for a phase 1 clinical trial. Today’s funding announcement will support 16 national research teams comprised of researchers, clinicians and trainees working to find improved treatment options and outcomes for cancer patients. BioCanRx’s funded partnerships will strengthen the coordination of research and resources in Canada to further develop a variety of cancer immunotherapy platforms. The research proposed could lead to significantly better outcomes for cancer patients and, potentially, curative approaches to their cancer. For full news release, fact sheets and more, please click here.